Director – Brian Henson, Screenplay – James V. Hart, Jerry Juhl & Kirk R. Thatcher, Based on the Novel Treasure Island by Robert Louis Stevenson, Producers – Brian Henson & Martin G. Baker, Photography – John Fenner, Music – Hans Zimmer, Songs – Barry Mann & Cynthia Weil, Visual Effects Supervisor – Thomas G. Smith, Special Effects Supervisor – Nick Allder, Muppet Coordinator – Kevin Clark, Production Design – Val Strazovec. Production Company – Jim Henson Productions/Disney. Jim Hawkins, along with his friends Gonzo and Rizzo, is working as scuttlebutt at the inn of Mrs Bluebridge when he is given a treasure map by the dying Billy Bones. Pursued by pirates wanting the map, Jim and the others set to sea in The Hispaniola under the frog captain Abraham Smollett. When the ship’s charismatic cook Long John Silver learns that Jim has the map, he becomes determined to obtain the treasure at all costs. Since the death of Jim Henson in 1990 and the inheritance of the Henson empire by his son Brian, things have fallen into a sad decline. Brian Henson sadly does not have his father’s creative sense and under his control, the Henson empire has been left milking Henson Sr’s highs. With a couple of exceptions – the delightful tv series Dinosaurs (1993-5) and the tv mini-series Gulliver’s Travels (1995) – all of the post-Jim Henson Henson efforts have only imitated former success. Brian has tried to squeeze everything he could out of the Muppet franchise – six films, The Muppet Christmas Carol (1992), this, Muppets from Space (1999), It’s a Very Merry Muppet Christmas Movie (2002), Kermit’s Swamp Years (2002) and The Muppet’s Wizard of Oz (2005) and a short-lived revival tv series Muppets Tonight (1996) – without realising that the Muppet phenomenon hit its peak and faded over fifteen years before. Outside of the Muppets, Brian has milked Jim’s other creations with The Adventures of Elmo in Grouchland (1999) and even tried to blatantly copy his own Dinosaurs with the awful flop sitcom Aliens in the Family (1997). The Muppets were subsequently more successfully revived on the big screen with The Muppets (2011), followed by Muppets Most Wanted (2014) and the tv series revival The Muppets (2015-6). All might be forgivable if Brian Hensons’s films were a spot on the joyous humour of the original The Muppet Show (1976-81) or the first two Muppet movies The Muppet Movie (1979) and The Great Muppet Caper (1981) – efforts that maintained on one level an inspiredly lunatic silliness for the kids and on another level sly asides for the adults in the audience. Unfortunately, Brian Hensons’s Muppet films are utterly predictable. They go through the Muppet moves but one knows exactly where all the jokes are going to fall. Brian’s films are not even original enough to create their own stories – The Muppet Christmas Carol, this and The Muppet’s Wizard of Oz are respectively Charles Dickens, Robert Louis Stevenson and L. Frank Baum’s perennials slavishly retold with Muppets cast in the various parts. 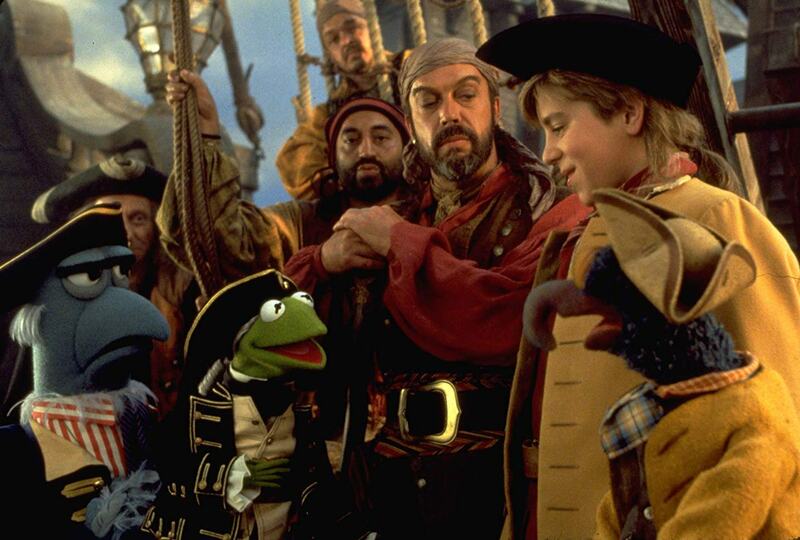 Muppet Treasure Island is frustratingly routine on all counts. The humour and the characters lack any inspired sparkle. Billy Connolly is always a good deal of infectious fun but he does not seem to be taking the film seriously. The only one to make the best of the show seems to be Tim Curry as Long John Silver who demonstrates that at least he was having masses of fun throughout.